Immuno-oncology has stolen the spotlight, but it is just one aspect of immunotherapy, one of the hottest trends in biopharma. According to Sapna Jha, a lead healthcare and life sciences analyst from Technavio, a market research company, cancer immunotherapies offer “better efficacy, enhanced safety, and higher patient adherence owing to less adverse effects” compared to traditional treatments, which has helped drive the immuno-oncology market. Technavio recently released a report on the “Global Immunotherapy Drugs Market 2016–2020” that estimated this market’s size at $114 billion for 2015. The report predicts that the market will continue to grow at a compound annual growth rate of 11.52% over the next four years, reaching a global market size of almost $200 billion by 2020. Yet oncology accounts for only 30% of the total immunotherapy drug market, according to Technavio’s analysis. Other top applications for immunotherapies include infectious and autoimmune diseases, which comprise approximately 60% of the market combined. The remaining 10% include treatments for respiratory, cardiovascular, ophthalmic, and neurological conditions. So typecasting all immunotherapies as oncology-specific treatments would be misleading, and while the success of checkpoint inhibitors may have initially captivated biopharma, the capacity for noncancer immunotherapies to save and improve patient lives makes them just as spotlight-worthy. In contrast to cancer, which is widely known, a recent survey by the Sepsis Alliance revealed that only 55% of Americans have heard of sepsis, a life-threatening condition caused by the overzealous immune response to an infection that can lead to organ dysfunction, failure, and often death. In fact, sepsis kills approximately one-third of the 30 million people it afflicts worldwide every year, according to the Global Sepsis Alliance. “There is nothing available today to effectively treat the runaway immune response and excessive cytokine production that occurs in sepsis without also crippling the immune system. Thus, despite the use of antibiotics, which only help treat the infection, sepsis mortality is still unacceptably high,” explained Phillip Chan, president and CEO, CytoSorbents. CytoSorbents’ flagship product, CytoSorb® tempers the immune response by “removing the fuel to the fire of inflammation,” which includes a broad range of cytokines, bacterial toxins, and other inflammatory mediators, from the blood via an extracorporeal purification cartridge that works with existing dialysis machines and blood pumps. CytoSorb is currently the only specifically approved extracorporeal cytokine adsorber in the European Union with a broad indication for use any time cytokines are elevated. The majority of the 14,000 CytoSorb treatments to date were for severe sepsis or septic shock, but nearly 3,000 cases were to control inflammation during open-heart surgery—the application CytoSorbents has zeroed in on to achieve U.S. regulatory approval. In addition to generating inflammation, a significant ramification of open-heart surgery is the release of free hemoglobin caused by hemolysis of red blood cells due to the shear forces exerted by cardiotomy suction, and the cardiopulmonary bypass machine used to oxygenate and pump blood through the body while the surgeon operates on the heart. The danger of free hemoglobin resides in its ability to cause organ injury and failure by harming blood vessel and organ endothelium through oxygen radical formation, and causing ischemia and vasoconstriction via nitric oxide scavenging. 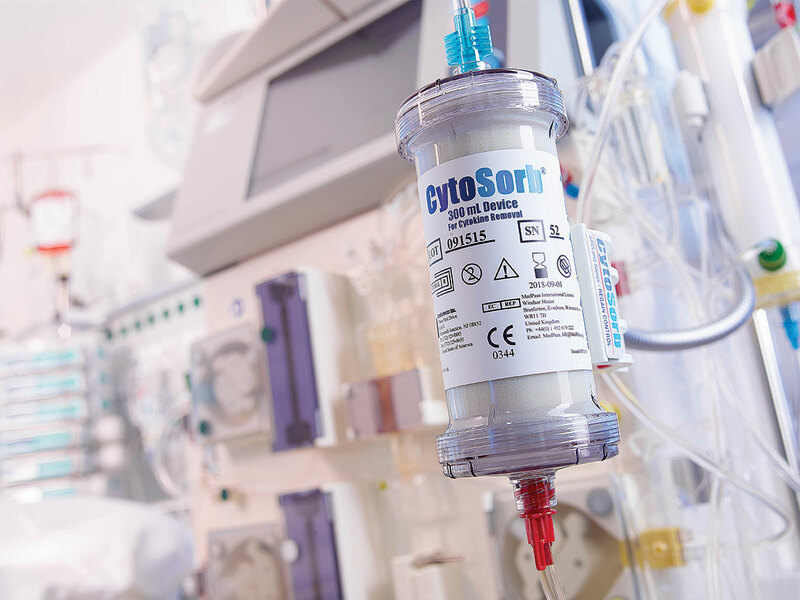 CytoSorbents’ REFRESH study uses CytoSorb intraoperatively to reduce free hemoglobin in complex cardiac surgeries by introducing the blood purification cartridge into the cardiopulmonary bypass circuit. CytoSorbents announced positive, top-line safety data from the study this October and plans to begin a pivotal study in 2017 with hopes of FDA approval by 2019. CytoSorbents’ extracorporeal cytokine adsorber, CytoSorb, removes cytokines, bacterial toxins, and other inflammatory mediators from the blood via size exclusion and surface adsorption using a highly biocompatible, porous, polymer bead cartridge. ImmusanT is one of many companies combating autoimmune diseases with an immunotherapy approach. They have developed an epitope-specific immunotherapy (ESIT) called Nexvax2® and biomarker toolkit for Celiac disease, an autoimmune disorder that causes inflammation and damage to the small intestine after gluten consumption due to an over-reactive immune response. ImmusanT has identified the three immunodominant peptides responsible for triggering the immune response in the 90% of patients with immune recognition genes for HLA-DQ2.5. Similar to allergy-specific vaccinations, Nexvax2 works by introducing a low, sub-stimulatory dose of the synthetically produced gluten peptides and then building up to higher levels, repeatedly exposing the immune system to the antigen until achieving a maintenance dose that shuts down the causative T-cells and eventually restores gluten tolerance. If successful in clinical trials, Nexvax2 will be the first therapy to demonstrate tolerance induction in an autoimmune disease. It would also be the first and only pharmacological treatment option available to Celiac patients, which comprises an estimated 1% of Americans—83% of whom remain either undiagnosed or misdiagnosed. To complement their therapy, ImmusanT has also established a blood-based assay that measures T-cell activity, through cytokine release, following a bolus gluten challenge to diagnose Celiac disease and monitor patient response to Nexvax2 treatment. Leslie Williams, CEO, ImmusanT, explained how the invasiveness of current diagnostic methods, which include an intestinal biopsy, and the lack of treatment options both contribute to the large number of undiagnosed cases: “I think when there are pharmacological options for patients they’ll be more motivated to be definitively diagnosed,” she said. Patients with chronic diseases may have few, or even no, options for treatment. However, as Scott Koenig, CEO, MacroGenics, expressed, the immunotherapy field has “opened up new avenues for diseases beyond oncology” bringing hope for relief to patients with chronic conditions. In addition to their cancer immunotherapies, MacroGenics has developed a recombinant molecule, referred to as MGD010, to treat autoimmune diseases by suppressing B-cell function using a novel platform called DART®. “DART is a platform where we have been able to design antibody-like structures that can incorporate two specificities into a single recombinant molecule,” described Koenig. The three-dimensional structure of these bi-specific molecules allows them to bind two targets on the same cell, or targets on two different cells, and bring them into close apposition. Unlike rituximab and other anti-CD20 drugs, MGD010 would inhibit activity without causing B-cell depletion. “CD32B and CD79B are essentially a checkpoint for B-cells. It’s the natural way that B-cells are regulated during normal B-cell activation,” Koenig added. ImmusanT’s Nexvax2® is a combination of three proprietary peptides that elicit an immune response in patients with celiac disease (CeD) who carry the immune recognition gene HLA-DQ2.5. The Nexvax2 immunotherapy aims to reprogram the T cells that respond to gluten antigens in CeD patients so that they stop responding defensively by triggering a pro-inflammatory response. MacroGenics has also exploited the ability of DART molecules to bind targets on two different cells in a novel HIV treatment (MGD014). While antiretroviral drugs have succeeded in significantly improving the lifespan of HIV and AIDS patients, a population of T-cells infected with nonreplicating, or latent, virus persists and will re-emerge if the patient stops treatment. MacroGenics’ HIV immunotherapy uses one of the available binding pockets to recognize HIV envelope proteins on infected T-cells, while the other pocket activates the cytolytic response in killer T-cells by engaging the CD3 receptor. If successful, MGD014 could help target and remove T-cells infected with latent virus populations to clear residual disease. as inflammatory bowel disease (IBD). Their approach is based on the “hygiene hypothesis,” the idea that the lack of immune stimulation from bacterial or viral exposure increases the risk for allergy, asthma, and immune-related diseases in people from developed countries. Qu Biologic’s immunotherapy stimulates the innate immune system through an intradermal injection of inactive bacterial components. “Our discovery is that the body’s response to acute infection by the innate immune system directs activated immune cells to the organ or tissue in which that bacteria normally causes infection,” revealed Hal Gunn, CEO, Qu Biologics. As a result, Qu Biologics can target the recruitment of activated immune cells to specific tissues or organs. 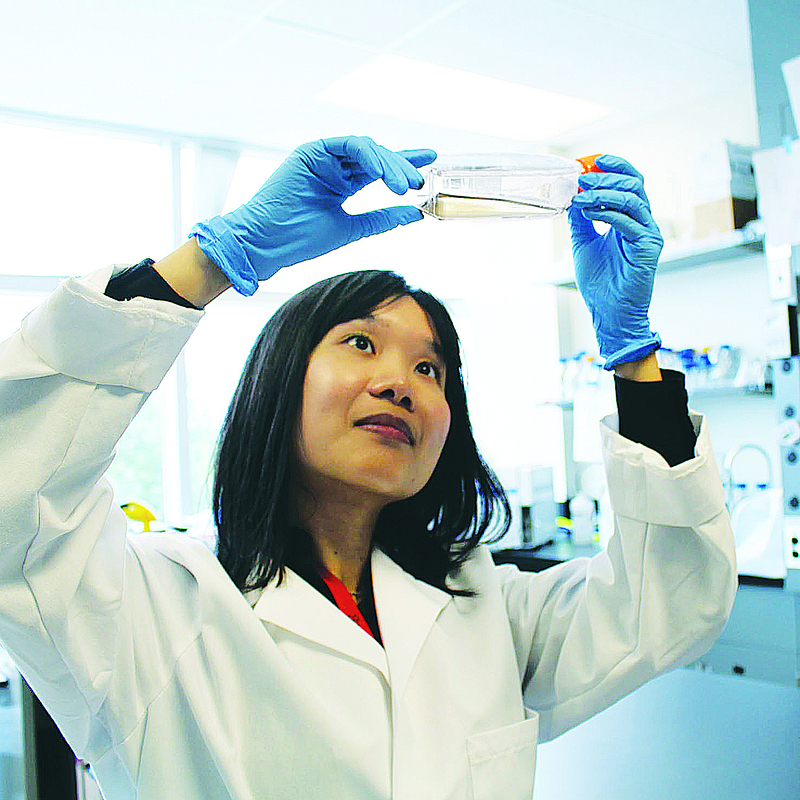 “If we make our immunotherapy from E. coli, a common gastrointestinal pathogen, we get a targeted response in the gastrointestinal tract,” Gunn elaborated. While IBD is considered an autoimmune disease Gunn professed. “What’s emerged is a recognition that the underlying problem may be a deficiency in the innate immune system that results in an inability to clear a bacterial infection or dysbiosis.” Thus, while current treatments that subdue the adaptive immune system succeed in reducing symptoms, they never address the underlying problem. “One important problem in immunological disease is that an imbalance has occurred, and the immune system is driven toward a dysfunctional cycle that it can’t get out of,” Gunn summarized. In the case of IBD, the innate immune system favors the “tissue repair” mode that suppresses the innate immune response and results in chronic inflammation and tissue damage. 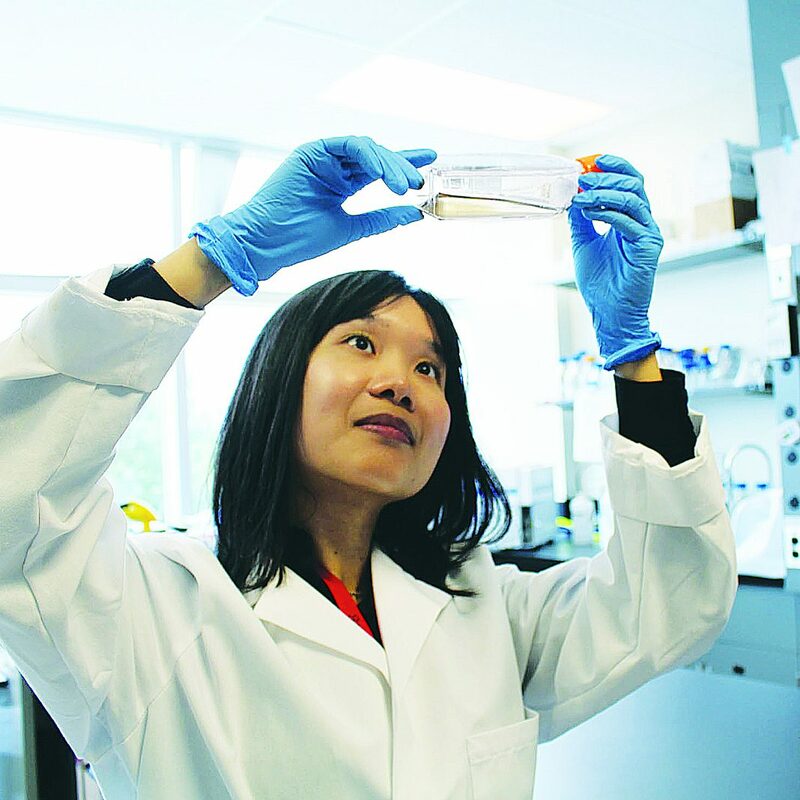 Qu Biologics hopes their approach can restore balance by shifting the innate immune system into “immunological” mode where it can clear the underlying bacterial infection and help patients achieve sustained remission. In their first small clinical trial, five out of twelve patients treated for IBD experienced sustained remission from the disease for more than four years without medication. From life-changing to life-saving, immunotherapies vary greatly in their approach, but they have all earned a spot in the limelight as they continue to alter the way clinicians and scientists treat disease.